When you face tooth loss, your oral health and facial structure change. Impaired speech, biting, and chewing, along with bone recession, tooth drifting, and premature facial aging, impact patients who lose even one tooth—dental implants counter these problems. Your dentist, Dr. Stephen Yi, at El Paso Viva Dental, can tell you if these artificial teeth could help your smile. Conventional dental prosthetics—bridges and full/partial dentures—cannot reproduce natural oral function or clear speech. Slippage, wear and tear on adjoining teeth, and more characterize these tooth replacements. Conversely, dental implants replicate natural smile aesthetics and oral function so well that patients forget they have tooth replacements. Why are dental implants successful? The answer lies in the attraction human bone has for the titanium in the dental implant screw. This is called osseointegration. 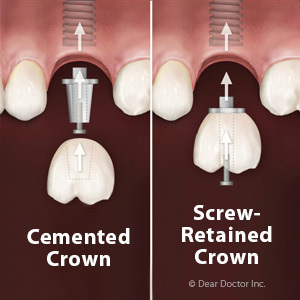 Once Dr. Yi surgically places a dental implant into the jaw bone, bone cells actively bond to the device, creating a firm foundation for the metal alloy post and ceramic crown which finish the single-tooth implant. 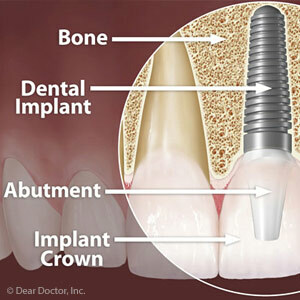 Most dental implant procedures involve the replacement of one tooth. However, multiple implants may support bridges or dentures, too. The single implant treatment takes a few visits to El Paso Viva Dental. Dr. Yi will examine and image your prospective implant site to ensure your mouth is healthy and has enough bone in the jaw to support an implant. These factors are essential to dental implant success. Then, he injects a local anesthetic to numb the area and opens the gums and jaw bone. He inserts the implant and closes the gums with sutures. At home, your gums and bone will heal. 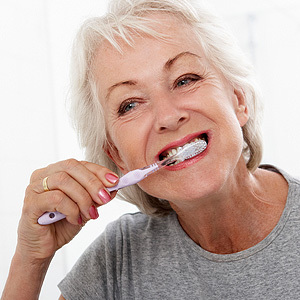 As they do so, osseointegration creates that inseparable bond dental implants are known for. After many weeks, you'll return to the dental office to receive the post and porcelain crown. Find out through a consultation with Dr. Stephen Yi. Call the El Paso Viva Dental today to arrange an appointment, and ask about the dental implant special. Phone (915) 751-1007. Smile gaps hurt your self-confidence, oral function, and jaw bone density. If you have lost teeth and wish to complete your smile, Dr. Steve Yi of El Paso Viva Dental in El Paso, TX, can help with dental implants. Secured with titanium screws inserted into the jaw bone, these amazing artificial teeth close gaps permanently. Because the screw is made of titanium, the human jaw bone adheres to it exceptionally well, forming an inseparable bond. The bond also ensures that the supporting bone and gum tissue remain intact and strong. This develops through a naturally-occurring mechanism called osseointegration. Osseointegration takes many weeks to accomplish, but when complete, both patient and dentist are assured of a reliably strong tooth replacement that will last indefinitely. Dental implant success rates are high, reports Dental Tribune Science, but sufficient healing time, diligent oral hygiene habits, and good overall health are critical to implant longevity. Dr. Yi likes to do a complete oral examination, including a visual inspection, X-rays, and a CT scan, to determine oral health and jaw bone strength. Also important is the location of the implant--front teeth are generally easier to replace--and if bone grafting is necessary. After this detailed consultation and a "yes" decision, the entire implant treatment happens at El Paso Viva Dental. The treatment involves incision of the gums and careful insertion of the implant into the bone. Sutures close the site, and the patient returns home to heal. Healing takes many weeks, and during that time, the patient must not bite or chew on the implant as those stresses threaten successful osseointegration. At the next dental appointment, Dr. Yi inspects the site, and if all is well, re-opens it and bonds on the extension post and customized crown. Afterwards, the patient gently uses the implant: eating, brushing, and flossing as usual. Dental implants look, feel, and bite just as real teeth do. When you smile, that gap is completely closed, and you can feel confident that your new tooth won't slip or make your speech odd or slurred. It can be yours with dental implants from El Paso Viva Dental. Contact the office for a consultation appointment in El Paso, TX, and ask about our special implant pricing. Call (915) 751-1007.